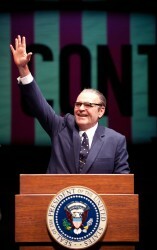 Jack Willis as President Lyndon B. Johnson in Robert Schenkkhan’s All The Way, at the Seattle Rep. Photo by Chris Bennion. Given the red, white and blue bunting splashing the lobby of the Seattle Rep on opening night, and the advertising blanketing the city, it’s as though the Rep is nominating Lyndon Baines Johnson for president in 2016. But their current co-production of Pulitzer-prize-winning playwright Robert Schenkkan’s epic double feature of LBJ’s “accidental presidency,” All the Way, running in repertory with its sequel The Great Society, is no political campaign. Instead part one of this docu-drama, All the Way, chronicles just eleven months of LBJ’s life, in three swirling hours of theatre time. The clock starts ticking in the immediate aftershocks of the assassination of President John F. Kennedy. The question as to whether LBJ’s ferocious determination to pass a Civil Rights Bill is for his own legacy, Kennedy’s or humankind, is at the core of Schenkkhan’s project. Centering the production, and at times carrying it on his broad shoulders, is the monumental performance of actor Jack Willis. Renewing his role, now spanning two seasons of the Oregon Shakespeare Festival’s premieres of Schenkkan’s opus, Willis’s mastery in (re)creating one of the great Southern Democrats is legions past a historicized imitation. As much as the two-part play is Schenkkan’s lens on the pinnacle of LBJ’s political thirst for life, the play belongs to Willis. In Willis’s clenched fists, the rendering of Johnson is as a bellowing bull, an authoritarian power monger, a much-loved or hated rancher who wants his people to act, obey and immediately do whatever he commands. This includes his bird-like (and sadly underwritten) wife Lady Bird (Terri McMahon), and Lyndon’s beyond-loyal assistant, Walter Jenkins (Danforth Comins). Walter is at Johnson’s side constantly; his surrogacy as a son to LBJ ends in Jenkins’ resignation and rejection after being caught in a homosexual act in a men’s restroom. Father rejected son so fast it was as though they were never connected at all. Rev. Dr. Martin Luther King is portrayed by Kenajuan Bentley with a dignified inner conflict. But the high stakes for the leadership of the civil rights movement are hard to grasp, especially if you are not already familiar with the historical figures. Stokely Carmichael (Wayne T. Carr) and Bob Moses (Kevin Kennerly) organize for SNCC, (the Student Non-Violent Organizing Committee.) Roy Wilkins (Abdul Sallam El Razzac) is the director of the more conservative National Association for the Advancement of Colored People (NAACP) and Rev. Ralph Abernathy (Tyrone Wilson) serves on the Southern Christian Leadership Conference (SCLC) with Dr. King. Each character represents their constituencies in trying to find a deal for a civil rights bill with the Johnson administration. These African Americans, along with their Caucasian rights workers (again “represented” by Jewish activist Stanley Levison) are under-drawn characters, hinted at by solid acting and fleeting mentions of their names. But someone unfamiliar with their unique places in history is left adrift-the narrative’s brief nod to the remarkable activist Fannie Lou Hamer (Bakesta King) seems an add-on, perhaps a response to a dramaturg’s concerns about the invisibility of women in the story (only 3 of 20 actors are women), not to mention the overt misogyny of LBJ, and the unspoken but well known disrespect of women in the movement from men such as Carmichael. Perhaps too harsh cutting of scenes from an earlier version gutted the vulnerable moments allowed in LBJ’s relationships with Walter and Bird. But rocket fire tempo has great payoff. Here, it is in the raw and ironic comedy that packs the show with laughs, and the excellent work of a tight, even slick ensemble. Ay, there’s the rub. The comic adeptness of the show keeps our attention, but the loss is to characters’ depths. We lose the beating of Johnson’s heart, revealing his need for approval, satisfaction and peace. There is just no breathing space. When LBJ finally shouts his need for solace and love to the world, Schenkkhan’s slashing lines ring rather flat. Far more stunning in comparison is the exacting style of Brechtian, information-based performance, one that exposes more than one side of history, asking the audience to think about their political memories, and this country’s historical legacies. This is the challenge of dramatizing history, or for that matter, historicizing drama. Which part of the story gets told? And at what cost? In this regard, it seems Rauch, Schenkkhan and company have opted for LBJ’s ambition and rage, and ironed out the wrinkles in time that revealed his vulnerability. When Walter gently removes LBJ’s glasses at night as the candidate/president surrenders to exhaustion, it is a much needed moment of human exchange. Sadly, it is staged so only a few could witness Lyndon’s moment of needing to be put to bed, and the utter devotion of his loyal retainer. The ensemble work by the actors is overall excellent in the playing, and they are given an astonishing canvas to play upon. The scenic work in the Rep’s staging is elegant, and unfolds with spectacular and aural storytelling. Presented as a jurybox, the aisles of congress, or pews of a church, the stage setting of mahogany-trimmed semi-circular benches face us and serve also as a neutral area for waiting, listening, and witnessing actors-becoming-characters. Despite a naggingly ghosting light on opening night, the sounds, video collages and projections transported the audience instantly to public and private settings of LBJ’s eleven months of power-by-assassination. Set Designer Christopher Acebo, Light Designer David Weiner, and Projections/Video Designer Shawn Sagady are a power ensemble all their own. Add the just-right costumes by Deborah M. Dryden and the evocative compositions by sound and music designer Paul James Prendergast and audiences can see that the ambition of this commission and production, a project championed by Artistic Director Jerry Manning for years before his untimely death, achieves artistic excellence in every sense of the word. Any of my concerns aside, Schenkkan’s masterwork, especially when considered alongside his Pulitzer prize-winning The Kentucky Cycle (born at Seattle Rep) has cemented his place as one of the most important playwrights dedicated to North American history. When the now-elected-in-his-own-right President Johnson takes center stage at the conclusion of both the 1964 election and All the Way, and roars “I am the President,” the audience is breathless, in part by his victory, which we knew was coming and yet still was stunning, and in part by knowing what awaits him when he creates “The Great Society”. The president who championed a War on Poverty, as well as civil and voting rights, Medicare, Medicaid and the devastating war in Vietnam would run for president only once. The higher a man of ambition climbs, the harder he will fall. Soon, I imagine, Jack Willis will utter LBJ’s words, “I shall not seek, and will not accept, my party’s nomination.” I’d sooner hear the echo from Willis than from Bryan Cranston, a wonderful actor, and yet somehow would have seemed wrong for this mostly OSF production. Why the producers chose to go with a film and television star can easily be imagined. But in my book, I’d like to officially award Jack Willis a Tony of his own. All the Way and The Great Society in Rep at Seattle Repertory Theatre until January 4, 2015 For dates and tickets see www.seattlerep.com or call 443-2210.